For other uses, see HTC (disambiguation). HTC Corporation (Chinese: 宏達國際電子股份有限公司; pinyin: Hóngdá Guójì Diànzǐ Gǔfèn Yǒuxiàn Gōngsī) (High Tech Computer Corporation, literally Hongda International Electronics Co., Ltd.) is a Taiwanese consumer electronics company headquartered in Xindian District, New Taipei City, Taiwan. Founded in 1997, HTC began as an original design manufacturer and original equipment manufacturer, designing and manufacturing laptop computers. After initially making smartphones based mostly on Windows Mobile, HTC became a co-founding member of the Open Handset Alliance, a group of handset manufacturers and mobile network operators dedicated to the development of the Android mobile operating system. The HTC Dream, marketed by T-Mobile in many countries as the T-Mobile G1, was the first phone on the market to run Android. Although initially successful as a smartphone vendor, competition from Apple Inc. and Samsung Electronics among others diluted its market share, reaching only 7.2% by April 2015, and the company has experienced consecutive net losses. In 2016, HTC began to diversify its business beyond smartphones, having partnered with Valve to produce a virtual reality platform known as HTC Vive. After having collaborated with the company on its Pixel smartphone, HTC sold roughly half of its design and research talent, as well as non-exclusive rights to smartphone-related IP, to Google in 2017 for US$1.1 billion. Cher Wang (王雪紅) and H. T. Cho (卓火土) founded HTC in 1997. Initially a manufacturer of notebook computers, HTC began designing some of the world's first touch and wireless hand-held devices in 1998. HTC started making Windows Mobile PDAs and smartphones starting from 2004 under the Qtek brand. In 2006 the range was rebranded as HTC with the launch of the HTC TyTN. In 2007, HTC acquired the mobile device company Dopod International. In 2008, HTC unveiled the HTC Max 4G, the first GSM mobile phone to support WiMAX networks. HTC joined Google's Open Handset Alliance and then developed and released the first device powered by Android OS in 2008, the HTC Dream. In November 2009 HTC released the HTC HD2, the first Windows Mobile device with a capacitive touchscreen. The same year, HTC Sense debuted as a user interface which continues to be used as of 2018. In July 2010, HTC announced it would begin selling HTC-branded smartphones in China in a partnership with China Mobile. In October 2010, HTC launched the brand tagline "quietly brilliant"', and the YOU campaign, HTC's first global advertising campaign. The same month, the HTC HD7 was released as one of the launch models of Microsoft's revitalised Windows Phone. In 2010, HTC sold over 24.6 million handsets, up 111% over 2009. In 2011, HTC started working with Luxgen. Luxgen vehicles are engineered to 'Think Ahead' for their drivers. Armed with advanced technology designed by Taiwan's global smart phone leader HTC, Luxgen vehicles are equipped with a suite of advanced features to preempt road conditions and potential hazards. All Luxgen vehicles feature a state of the art onboard computer system, dubbed the 'Think+', which, for the first time ever, combines HTC smart technology and Windows CE Automotive interface. At the Mobile World Congress in February 2011, the GSM Association named HTC the "Device Manufacturer of the Year" in its Global Mobile Awards. In April 2011, HTC surpassed Nokia as the third-largest smartphone manufacturer by market share, behind Apple and Samsung. On 6 July 2011, it was announced that HTC would buy VIA Technologies' stake in S3 Graphics. On 6 August 2011, HTC acquired Dashwire for $18.5M. In August 2011, HTC confirmed a plan for a strategic partnership with Beats Electronics involving acquiring 51 percent of the company. The 2011 Best Global Brands rankings released by Interbrand, listed HTC at #98 and valued it at $3.6 billion. Based on researcher Canalys, in Q3 2011 HTC Corporation became the largest smartphone vendor in the U.S. with 24 percent market share, ahead of Samsung's 21 percent, Apple's 20 percent and BlackBerry's 9 percent. HTC Corporation made different models for each operator. During early 2012, HTC lost much of this U.S. market share due to increased competition from Apple and Samsung. According to analyst firm comScore, HTC only accounted for 9.3% of the United States smartphone market as of February 2013. In light of the company's decrease in prominence, Chief Executive Peter Chou had informed executives that he would step down if the company's newest flagship phone, the 2013 HTC One, had failed to generate impressive sales results. HTC's first quarter results for 2013 showed its year-over-year profit drop by 98.1%, making it the smallest-ever profit for the company—the delay of the launch of the HTC One was cited as one of the factors. 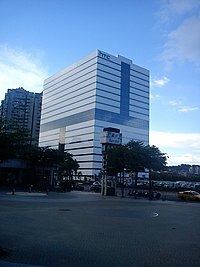 In June 2012, HTC moved its headquarters from Taoyuan City (now Taoyuan District) to Xindian District, New Taipei City. On 14 January 2013, HTC launched its smartphones in Burma. The HTC One was released in mid-2013 and, subsequently won various industry awards in the best smartphone and best design categories, but global sales of the HTC One were lower than those for Samsung's Galaxy S4 flagship handset and HTC recorded its first ever quarterly loss in early October 2013: a deficit of just under NT$3 billion (about US$100m, £62m). Marketing problems were identified by HTC as the primary reason for its comparative performance, a factor that had been previously cited by the company. During 2013, Microsoft were in negotiations to purchase HTC. This was only revealed in 2018 by Risto Siilasmaa, chairman of Nokia, in an interview with the Helsingin Sanomat. Microsoft would eventually purchase Nokia's mobile phone business that year. Following the release of the HTC One, two variants were released to form a trio for the 2013 HTC One lineup. A smaller variant named the HTC One Mini was released in August 2013, and a larger variant named the HTC One Max was released in October 2013. Similar in design and features to the HTC One, the upgraded aspects of the One Max include a display measuring 5.9 inches (15 cm), a fingerprint sensor and a removable back cover for expandable memory. The product was released into the European and Asian retail environment in October 2013, followed by a US launch in early November 2013. In March 2014, HTC released the HTC One (M8), the next version of the HTC One flagship, at press conferences in London and New York City. In a change from previous launches, the HTC One was made available for purchase on the company website and North American mobile carrier websites on the same day a few hours after the launch. In April 2014, HTC reported sales climbing 12.7 percent to NT$22.1 billion, the company's fastest growth since October 2011. In September 2014, Google selected HTC to make its Nexus 9 tablet. In August 2014 HTC announced a Windows Phone-powered variant of the One (M8), their first using the operating system since 2012. HTC ended its long relationship with Microsoft afterwards due to Nokia's dominance in Windows Phone devices, and started focusing solely on Android. On 1 March 2015, HTC unveiled Vive, a virtual reality head-mounted display in collaboration with Valve Corporation. In June and October 2015, HTC reported net losses; the company has faced increased competition from other smartphone makers, including Apple, Samsung, and others, which had resulted in a decline in its smartphone sales, as well a major loss of market share. Its smartphone market share had risen back to 7.2 percent in April 2015 due to its strong sales of recent devices, but HTC's stock price had fallen by 90 percent since 2011. In November 2016, HTC reported that it had sold at least 140,000 Vive units, and that each unit was being sold at a profit. In January 2017, HTC unveiled its new U series smartphone line, the U Play and U Ultra; the company described the U series as a "new direction" for its phones, emphasizing an integrated virtual assistant developed by the company. In February 2017, HTC reported that in the fourth quarter of 2016, its operating losses had decreased by 13% year-over-year, citing "robust sales performance" and sequential revenue increases throughout the year. On 21 September 2017, Google announced that it would acquire roughly half of the 4,000 employees who worked in HTC's design and research staff, and non-exclusive licences to smartphone-related intellectual property held by HTC, for US$1.1 billion. The employees included the team involved with Google's Pixel smartphone, which was manufactured by HTC. Google stated that the purchase was part of its efforts to bolster its first-party hardware business. The transaction was completed on 30 January 2018; while HTC will continue to produce its own smartphones, the company has stated that it planned to increase its focus on Internet of Things (IoT) and virtual reality going forward. On 26 March 2018, HTC reported a quarterly net loss of US$337 million in the fourth quarter of 2017, citing "market competition, product mix, pricing, and recognized inventory write-downs". The company's transaction with Google will be reflected in its first quarter 2018 numbers. HTC stated that it would use the revenue to further its investments in "emerging technologies". The company had also cited its increasing VR investments, including its upcoming Vive Pro model, and Vive Focus—a standalone "all-in-one" VR headset unveiled in November 2017. In July 2018 HTC has revealed that it has entered into a partnership with games and apps developer and publisher Animoca. This includes product development and joint collaboration in areas such as games, blockchain, artificial intelligence, machine learning, augmented reality and virtual reality. Animoca's games will be pre-installed on HTC devices in the future. In March 2010, Apple Inc. filed a complaint with the US International Trade Commission claiming infringement of 20 of its patents covering aspects of the iPhone user interface and hardware. HTC disagreed with Apple's actions and reiterated its commitment to creating innovative smartphones. HTC also filed a complaint against Apple for infringing on five of its patents and sought to ban the import of Apple products into the US from manufacturing facilities in Asia. Apple expanded its original complaint by adding two more patents. On 10 November 2012, Apple and HTC reached a 10-year license-agreement covering current and future patents held by the two companies. The terms of the agreement remain confidential. In February 2013, HTC settled with the U.S. Federal Trade Commission concerning lax security on more than 18 million smartphones and tablets it had shipped to customers and agreed to security patches. HTC's chairwoman and acting CEO is Cher Wang who is the daughter of the late Wang Yung-ching, founder of the plastics and petrochemicals conglomerate Formosa Plastics Group. Peter Chou serves as head of the HTC Future Development Lab, and HT Cho as Director of the Board and Chairman of HTC Foundation. HTC's CFO is Hui-Ming Cheng. In addition to being chair of HTC, Cher Wang is also acting chair of VIA Technologies. HTC's main divisions, including the IA (Information Appliance) engineering division and the WM (Wireless Mobile) engineering division, are ISO 9001/ISO 14001-qualified facilities. The company's growth has accelerated dramatically[clarification needed] since being chosen by Microsoft as a hardware platform development partner for the Windows Mobile operating system (based on Windows CE). HTC also works with Google to build mobile phones running Google's Android mobile OS such as the Nexus One. HTC's sales revenue totalled $2.2 billion for 2005, a 102% increase from the prior year. In 2005 it was listed as the fastest-growing tech company in BusinessWeeks Info Tech 100. HTC invested strongly in research and development, which accounts for a quarter of its employees. The company's North American headquarters are located in Bellevue, Washington. HTC runs a software design office in Seattle (near its North American headquarters) where it designs its own interface for its phones. In 2011, HTC also opened a research and development office in Durham, North Carolina, a location the company chose over Seattle and Atlanta, to focus on multiple areas of wireless technology. On 17 February 2010, Fast Company ranked HTC as the 31st most innovative company in the world. On 27 May 2011, in response to customer feedback, HTC announced that they will no longer lock the bootloaders on their Android based phones. HTC sponsored the HTC-Highroad professional cycling team from 2009 to 2011. In 2012, HTC became the official smartphone sponsor of the UEFA Champions League and UEFA Europa League. The contract will last for three years and makes HTC one of the main sponsors of the two competitions. HTC also became the shirt sponsors for the Indian Super League franchise NorthEast United FC for the 2014, 2015 and 2016 season. Ahead of the 2015 season, Indian Premier League franchise Kings XI Punjab signed a sponsorship deal with HTC. According to the agreement, HTC would be the team's official principal sponsor, and the company's logo would occupy the right chest position on the Kings XI Punjab playing jersey. HTC sponsors professional eSports teams FaZe Clan, Team SoloMid, Cloud9, Team Liquid, and J Team, (formerly known as Taipei Assassins). HTC sponsored a Super Smash Bros. Melee tournament, HTC Throwdown, which was held on 19 September 2015, in San Francisco. At the end of 2015, the company also sponsored the creation of that year's SSBMRank, the annual rankings of the best Melee players in the world. ^ a b c "2018 Q4 Financial Results - Consolidated Financial Report (IFRS)" (PDF). Retrieved 2019-04-01. ^ "HTC Desire 526 price, specifications, features, comparison". NDTV Gadgets360.com. Retrieved 2017-11-25. ^ "Google unveils cell phone software and alliance". CNET News. 2007-11-05. Retrieved 2010-07-08. ^ a b "About HTC". HTC Corporation. Retrieved 2013-01-01. ^ a b c Holson, Laura (2008-10-26). "With Smartphones, Cher Wang Made Her Own Fortune". The New York Times. Retrieved 2010-07-08. ^ tweet_btn(), Leo Waldock 15 Jun 2006 at 14:48. "HTC launches its first Windows 3G phones". www.theregister.co.uk. ^ Koh, Damian (2007-05-11). "Dopod to assume HTC name". ZDNet. Retrieved 2012-12-20. ^ "HTC MAX 4G officially announced, world's first GSM / WiMAX phone". Engadget. Retrieved 2018-03-28. ^ "The evolution of the mobile phone, from the Motorola DynaTAC to the Samsung Galaxy S9". February 23, 2018 – via www.telegraph.co.uk. ^ phones, Gareth Beavis 2009-11-06T16:19:00 309ZMobile. "HTC HD2 review". TechRadar. ^ Chao, Loretta (2010-07-27). "HTC to Sell Branded Smartphones in Mainland Push". The Wall Street Journal. Retrieved 2010-07-27. ^ Nita, Ilinca (2009-10-26). "HTC unveils YOU advertising campaign, Quietly Brilliant brand". Unwiredview.com. Unwired View. Retrieved 2013-09-24. ^ phones, Gareth Beavis 2010-10-20T23:02:00 292ZMobile. "HTC HD7 review". TechRadar. ^ "HTC mobile phone shipments and revenues skyrocket in 2010". IntoMobile. 2011-01-21. Retrieved 2011-01-22. ^ Thomas Ricker (August 24, 2009). "Video: HTC develops THINK+ car computer for LUXGEN 7 MPV". Engadget. ^ Kennemer, Quentyn (16 February 2011). "HTC Wins Device Manufacturer of the Year at Annual Global Mobile Awards". Phandroid - Android News and Reviews. ^ "Smartphone Upstart HTC Triples Earnings As Sales Double". Forbes. 2011-04-08. Retrieved 2011-04-08. ^ "DailyTech - VIA, WTI Sell Stakes in S3 Graphics to HTC". ^ "HTC United Kingdom". HTC. ^ "HTC's Big Announcement: HTC To Acquire Majority Stake In Beats By Dr. Dre". 11 August 2011. ^ Anderson, Ash. "HTC to Invest $300M in Beats Audio". KeyNoodle. Retrieved 11 August 2011. ^ "Top 100 global brands 2011: Taiwan-based HTC jumps onto the list for the first time". Taiwan News. 2011-10-05. Retrieved 2011-10-05. ^ "2011 Ranking of the Top 100 Brands". Interbrand. Archived from the original on 2011-10-06. Retrieved 2011-10-05. ^ Culpan, Tim; Miller, Hugo (2 November 2011). "HTC Takes Lead in U.S. Smartphone Market as Apple, RIM Decline". Bloomberg. ^ Culpan, Tim (6 February 2012). "HTC Trails Estimates as It Awaits New Models". Bloomberg. ^ Flosi, Stephanie (4 April 2013). "comScore Reports February 2013 U.S. Smartphone Subscriber Market Share". comScore. ^ Luk, Lorraine (19 March 2013). "HTC Delays Launch of New Phone". Wall Street Journal. ^ Eric Zeman, Eric (8 April 2013). "HTC One Delay Costly: Profit Drops 98%". InformationWeek. Retrieved 8 April 2013. ^ "HTC beats rivals with Burmese fonts". Investvine.com. 2013-01-16. Retrieved 2013-02-03. ^ Kelion, Leo (14 October 2013). "HTC One Max fingerprint phablet unveiled early". BBC News. Retrieved 4 November 2013. ^ "Jorma Ollila brought Nokia great success. But did he also bring the company down? The former phone giant's current chairman Risto Siilasmaa tells us what he witnessed". Helsingin Sanomat. September 28, 2018. ^ Hamburger, Ellis (12 August 2013). "HTC debuts 'Change' ad campaign with Robert Downey Jr. as frontman". The Verge. Vox Media. Retrieved 24 September 2013. ^ a b Yu-Huay Sun; Edmond Lococo (27 September 2013). "HTC to Sell Back Stake in Beats Electronics for $265 Million". Bloomberg. Retrieved 29 September 2013. ^ "HTC cuts connections with Beats – sells back 24.84% shares". 27 September 2013. ^ Etherington, Darrel (8 October 2013). "HTC One Max Will Have Fingerprint Sensor And Be Introduced Next Week, WSJ Reports". TechCrunch. AOL Inc. Retrieved 8 October 2013. ^ Etherington, Darrell (14 October 2013). "5.9-inch HTC One Max With Fingerprint Sensor Allows You To Launch Apps With A Touch". TechCrunch. AOL Inc. Retrieved 15 October 2013. ^ Covert, Adrian (25 March 2014). "HTC One M8: The most beautiful smartphone". CNNMoney. CNN. Retrieved 27 March 2014. ^ Culpan, Tim (2014-05-06). "HTC Sees Revenue and Profit Beating Estimates as M8 Drives Sales". Bloomberg. ^ "Google selects HTC for upcoming Nexus tablet: WSJ". Reuters. 2014-09-22. Retrieved 2014-09-22. ^ Mundy, Jon (August 14, 2013). "HTC reportedly set to to(sic) ditch Windows Phone 8". Trusted Reviews. ^ "Valve, HTC Offering Free Vive VR to Developers". PC Magazine. Retrieved 2018-03-28. ^ "HTC continues to prove unprofitable as sales dwindle". CNET. Retrieved 7 June 2016. ^ "The HTC Vive has sold "much more" than 140,000 units, each at a profit". PCGamesN. Retrieved 2018-03-28. ^ "HTC outs an always listening, dual-screen smartphone with its own AI assistant". TechCrunch. Retrieved 2018-03-28. ^ "HTC has another tough quarter, with revenue down 13% YOY, but smaller losses". TechCrunch. Retrieved 2018-03-28. ^ "Google is buying part of HTC's smartphone team for $1.1 billion". The Verge. Retrieved 2017-09-21. ^ Wakabayashi, Daisuke (2017-09-20). "Google Is Buying HTC's Smartphone Expertise for $1.1 Billion". The New York Times. ISSN 0362-4331. Retrieved 2018-03-28. ^ "Google completes its $1.1 billion HTC deal". Engadget. Retrieved 2018-03-28. ^ "HTC had a terrible holiday quarter". TechCrunch. Retrieved 2018-03-28. ^ "HTC reveals standalone Vive Focus VR headset and cancels Daydream plans". The Verge. Retrieved 2018-03-28. ^ Harris, Iain; Writer, Staff. "Mobile publisher Animoca Brands raises $4.5 million through over-subscribed share placement". pocketgamer.biz. ^ Tchetvertakov, George (July 12, 2018). "Animoca Brands partners with HTC for capital and mobile distribution boost". ^ Vanacore, Andrew (2010-03-02). "Apple suing phone maker HTC over iPhone patents". Bloomberg Businessweek. Retrieved 2010-07-07. ^ "HTC Disagrees with Apple's Actions". HTC Corporation. 2010-03-17. Retrieved 2010-07-08. ^ "HTC Sues Apple for Patent Infringement". HTC Corporation. 2010-05-12. Archived from the original on 2010-05-13. Retrieved 2010-07-08. ^ "US trade body to look into HTC complaint against Apple". AFP. 2010-06-11. Retrieved 2010-07-07. ^ "Apple expands patent infringement suit against HTC". Wired Magazine. 12 November 2012. Retrieved 12 November 2012. ^ Wyatt, Edward (22 February 2013). "HTC Settles Privacy Case Over Flaws in Phones". New York Times. ^ "HTC America Settles FTC Charges It Failed to Secure Millions of Mobile Devices Shipped to Consumers". Ftc.gov. 2013-02-22. Retrieved 2013-03-03. ^ Fair, Lesley. "Device Squad: The story behind the FTC's first case against a mobile device maker | BCP Business Center". Business.ftc.gov. Retrieved 2013-03-03. ^ Woyke, Elizabeth (2009-10-28). "HTC CEO on Android, Verizon, Microsoft". Forbes. Archived from the original on 2009-10-30. Retrieved 2010-07-08. ^ "HTC June 2009 Sales Report". redOrbit. 2009-08-03. Retrieved 2010-07-08. ^ "Update 1: Taiwan's HTC sees 2008 sales at high end of target". Reuters UK. 2008-09-12. Retrieved 2010-07-08. ^ "HTC company profile". PhoneDog. Retrieved 2010-07-08. ^ Metz, Cade. "Google uncloaks the Nexus One". The Register. ^ "The IT 100 Companies: The Leading Tech Companies of 2005". ^ "About HTC - Contact Us". Archived from the original on 30 December 2010. Retrieved 6 August 2010. ^ "HTC Launches Multi-Million Dollar Ad Campaign About 'You' To Become Household Name". mocoNews. 26 October 2009. ^ Bracken, David (2010-12-22). "HTC will come to Triangle". News & Observer. Archived from the original on 2010-12-25. Retrieved 2010-12-22. ^ Whitney, Lance (2010-12-21). "HTC opening R&D office to focus on wireless tech". CNET News. Retrieved 2010-12-22. ^ Macsai, Dan (2010-02-17). "Most Innovative Companies - 2010: HTC". Fast Company. Retrieved 2010-07-08. ^ Hildenbrand, Jerry (27 May 2011). "HTC: No more locked bootloaders"
^ "HTC becomes Champions League sponsor". Marketing Week. ^ "NorthEast United FC retains HTC as its Lead Sponsor for ISL-Season II". ^ "KXIP signs HTC as official principal sponsor for IPL 8". The Hindu. 8 January 2015. Retrieved 20 March 2018. ^ "HTCeSports". Twitter. Retrieved 7 January 2016. ^ "HTC Throwdown". smash.gg. Retrieved 6 January 2016. ^ Lee, Daniel (21 December 2015). "SSBMRank 2015 #100-91". Melee It on Me. Retrieved 7 January 2016. Wikimedia Commons has media related to HTC Corporation.